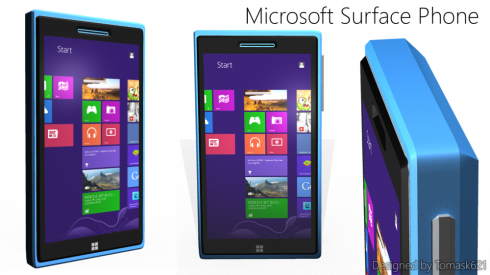 Created by Tomask621, the new Microsoft Surface Phone pictured here runs Windows 8 Pro instead of Windows Phone 8. That may also explain why it’s so bulky, since its hardware is probably on par with an ultrabook, if you allow me to exaggerate a bit. Specs include a 5 inch 1366 x 768 pixel display, an Intel Atom dual core x86 processor, 2 GB of RAM and a 3600 mAh battery. I can’t seem to spot a Search button and Back button at the bottom, so I guess gestures will have to do, I mean the Windows 8 ones. I’m also curious if we’ve got a Desktop mode here or not, seeing how this is a phone and all. Since this Microsoft Surface Phone is thick, the only hope of it not being too massive is having a lower weight. I aso think that the volume buttons on the right side are a bit exaggerated in size.